Locating three hours south east of L.A. and two and half hours east of San Diego, Salvation Mountain is truly one of the most remarkable, unique, and fascinating landmarks of Southern California. Regardless of being starred in a popular film, Into the Wild, and appearances on popular blogs and magazines, this sanctuary remains a secret to most locals and is yet to be visited by many explorers. 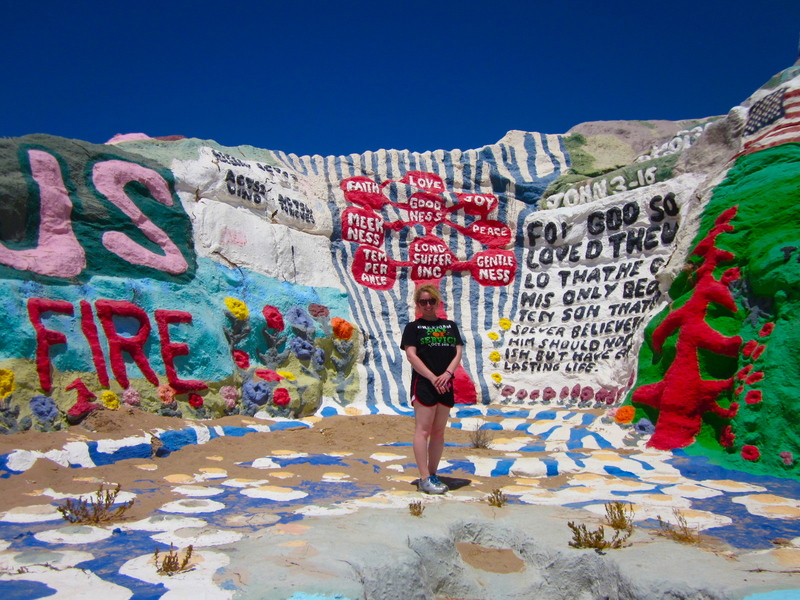 In simplest description, Salvation Mountain is a small hill that is completely man-made, and it has several phrases from the bible painted all over it. However, I just want to say that there’s no need for description for this place. Just go see it for yourself! 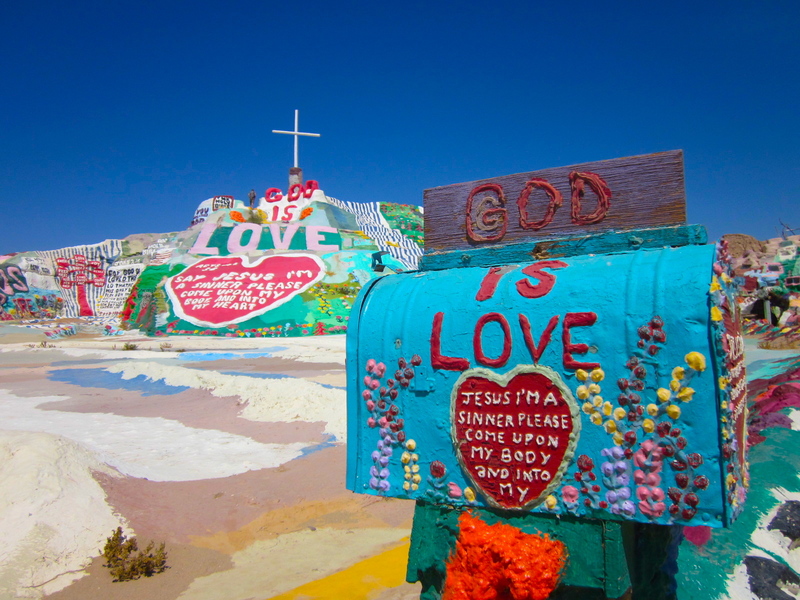 Leonard Knight spent about thirty years building Salvation Mountain. Only faith and love can fuel a man to single handedly start and finish such an amazing and ambitious project. Knight wants to spread God’s message of love and share his passion with thousands of visitors that come by to admire his creation yearly. 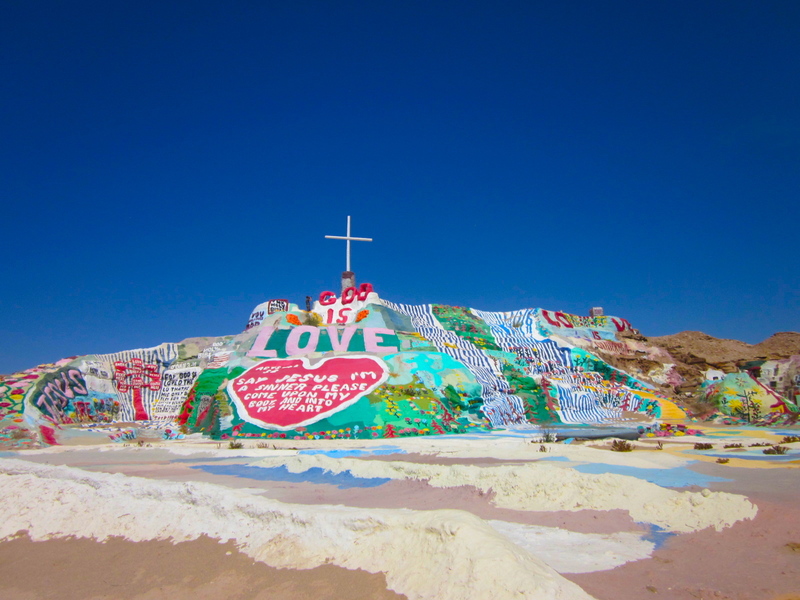 The mountain is built entirely by adobe, straw, and thousands of gallons of paint. This is also not the first mountain. 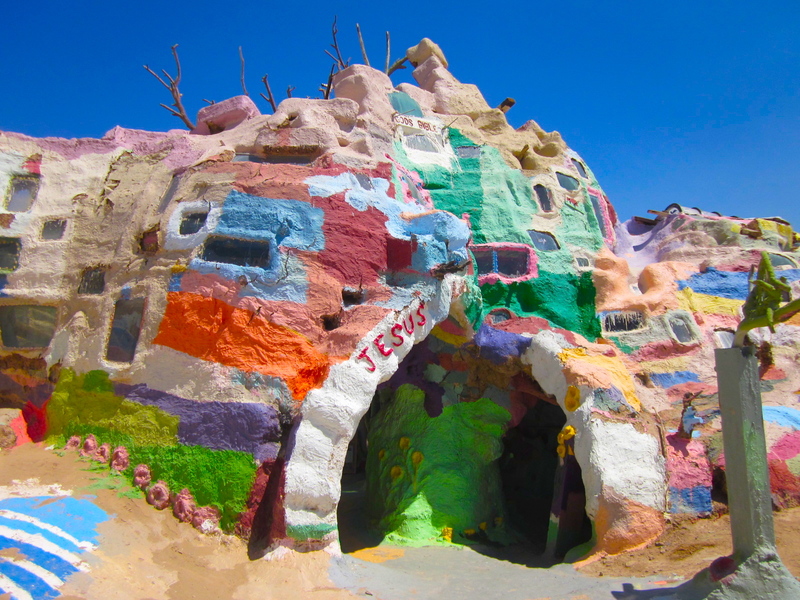 The original Salvation Mountain was destroyed due to poor construction and inappropriate materials. However, that did not stop Knight from restarting. I find this place to be ironic in itself. 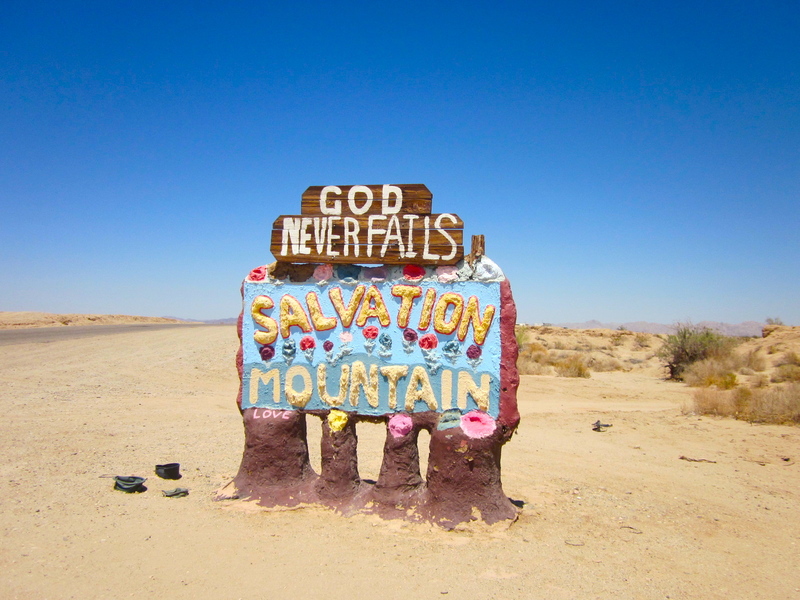 Salvation is located only 30 minutes east of Salton Sea, which if you know, is one of the biggest man made disasters in the U.S. The largest inland body of water in California that was absolutely wasted after turned too salty for consumption due to pollution. Only a few minutes east of the mountain is Slab City which can be viewed as either liberating or depressing. The city is called “Slab” because it’s literally almost made out of cardboard boxes, old cars, trailers, and tents; there’s no electricity and running water. 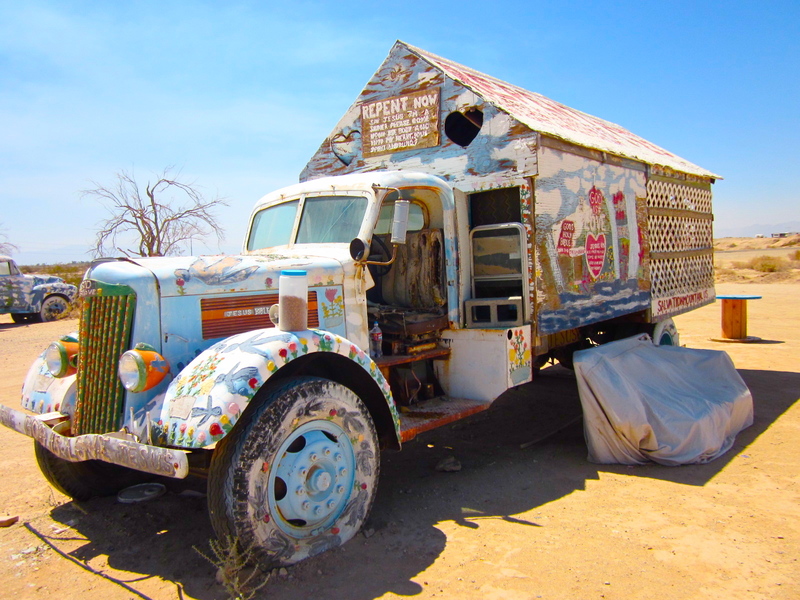 Being in the desert, the residents of Slab City endure extreme hot weather during the day and freezing cold nights. The place is where many Americans have relocated to after not being able to live elsewhere. I won’t go into too much detail about Slab City to respect the residents of the town as I neither have lived there or been there long enough to really understand the place. However, I still find this mountain that is created by and for love, faith, hope, and passion to be located so close to what mainstream society would consider as “failure”. Maybe, the mountain is perfectly located. There’s always hope somewhere. The mountain also has many rooms and a small museum that have recently been built by Knight himself in the past few years. When it gets too hot outside to climb the mountain, these rooms within the museum provide good shade to hide in. Aside from the museum and the mountain that you can climb on, there are also a few cars and trucks that are also painted. This place is just truly amazing. I cannot get over the fact that one man made this entire place himself. My friends and I spent about two hours here. We really wanted to spend more time here, but we visited during a hot day when it was almost 110, so we decided to head out early. We also drank an entire gallon of water. From L.A. and O.C., you’ll take I-10 east all the way pass Palm Spring and Cabazon Dinosaur before taking HWY 111 all the way down pass Salton Sea, which you should definitely stop by to check out. Once you reach Niland, you will get on Main Street and drive east. It won’t be too long before Main street turns into Beal Road, and you should be able to spot the mountain from distant. Yes, it’s huge! This colorful stunning mountain will stand out in this dry and sandy desert. From S.D., you will take 8 east and HWY 111 north, and then Niland Ave to Main Street. Definitely bring a ton of water and food. There’s nothing really around, and there are definitely not a lot of options. What we did was we picnic at Salton Sea before we drove to Salvation Mountain. You can do that as well if you’re coming from L.A. area. This place is largely outdoor, so sunscreen and layers are recommended. Yes, it’s hot, but cover yourself and don’t get burnt. The pictures are sooo amazing it looks surreal! Thank you Fiona! It was a beautiful day and the place was so amazing, you cannot possibly take a bad picture. I agree completely! it’s such a unique place. Although i may not be as passionate about the message but i feel the energy and passion and dedication that was put into this amazing place!